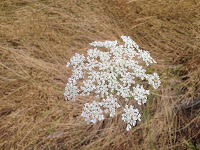 The Queen Anne's Lace is still blooming in the area around the William Kaulehelehe House site and we are still finishing up excavations there, although most of the activity has been at the Little Prouxl site. I spent a bit of time last week doing some finishing up work to close out the small 1 X 5 meter trench that tested the Hawaiian preachers house (Block K). I had expected to find a few subsurface post and stake holes like we often encounter in the area beneath the dirt floors of the fur trade houses at Fort Vancouver. After carefully troweling the floor and finding a few minor stains that had little depth and may have been associated with natural processes, I decided that the western-most unit needed at least one more level to make sure that we had not missed anything. As often happens, this decision led to an increasingly more complex excavation challenge and some very interesting finds. The eastern margin of the unit contained a nice gray clay, similar to the house floor at the Little Prouxl site, although this was on the outer, western edge of a shallow pit feature that we had excavated earlier in the summer. 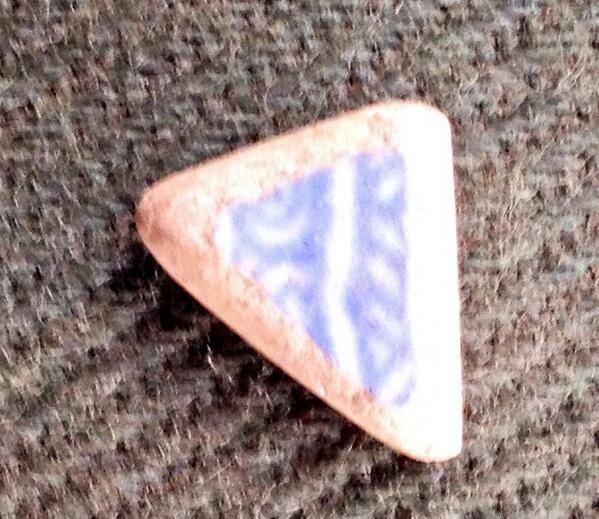 Importantly, this clay seemed to dive to the east. Following this clay proved to be very surprising as what had been thought to be culturally-sterile sediments below the floor turned out to be a fill with a similar color and texture, but that contained a number of artifacts from the house construction including square nails and window glass. Gilt ring found at the William Kaulehelehe house site. 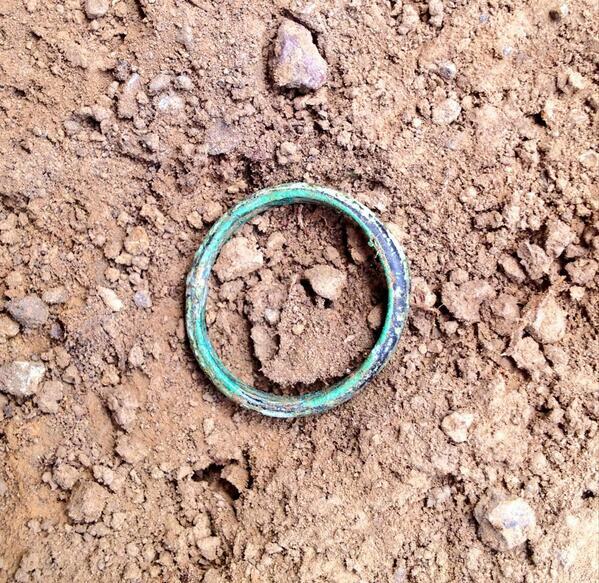 Interestingly, on the western margins of the clay-lined pit or trench, a man's gilt ring was found. While not of much real value (the gilt is all but gone), this ring is somewhat more fancy than the typical trade rings found at the Fort. While far from a priceless piece of jewelry, it is intriguing to think that this may have been the personal property of the Hawaiian minister that was lost one day. One wonders if it had any meaning to him or if he even mourned its loss. rounded edges. While the transferprint pattern is quite distinctive, the rounding and the small size of the object suggest that it may be an artifact that was subjected to a unique formation process after it was deposited. 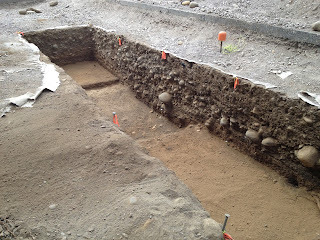 Another site associated with the Catholic Mission that we dug on City of Vancouver property about 9 years ago contained similar objects that we interpreted to be gastroliths, or gizzard stones, probably from chickens or some other domesticated fowl. Birds don't have teeth and to compensate for this, they injest small rocks and other objects (sometimes glass and sometimes ceramics) to help in grinding down their food. These gizzard stones have been found on archaeological sites before and give a clue, albeit diminutive in size, as to the presence and sometimes the processing of fowl. 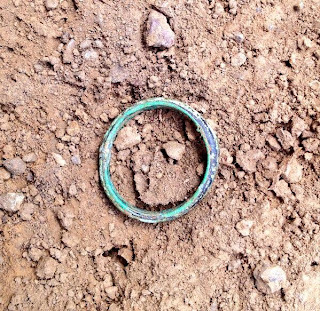 On a related note, the clay beneath the ring appears to contain a great deal of bird shot although it is unknown if this represents an area where birds were processed or simply the loss of many very small objects. In a small test of the clay, I found nearly 50 pieces of shot. As we had some cloud cover today, I spent a bit of time cleaning up the features of Block K including the newly exposed clay-lined pit/trench and then took photographs to create a 3D model of the test trench. I made a short YouTube video that you may access at the link below.